There is a lot of interest in intrinsic motivation. We are intrinsically motivated when we are doing things that interest us and that we enjoy. These are activities for which we do not have to be encouraged. Encouraging or rewarding people for doing something for which they are already intrinsically motivated can even less that intrinsic motivation. What you find interesting, by the way, is not fixed. It can and will keep on developing. The reason is that when you are busy doing what you find interesting you will encounter new information and new questions which may renew and strengthen your curiosity and interest. Intrinsic motivation is easily recognizable in the behavior of children. When they are playing they are intrinsically motivated. Being intrinsically motivated does not only seem to be enjoyable but also functional or useful. For example, as children are playing they learn all kinds of things about the world. It is thought that intrinsic motivation plays an important role in learning new skills, both in children and adults. Devloo et al. (2014) found evidence that intrinsic motivation plays an important role in innovative behavior. Taylor et al. (2014) found evidence that intrinsic motivation was the only consistent predictor of school success. It is not strange to think that there is a reciprocal relation between intrinsic motivation and achievement. By doing things which you find interesting you encounter new information and your competence grows. By becoming more competent you may start to find new things interesting and enjoyable. An indication for a reciprocal relation between intrinsic motivation and achievement can be found in a study by Vink et al. (2014) which showed that intrinsic motivation and deliberate practice strengthen each other. But a new study by Garon-Carrier et al. (2015) seems to indicate that the relation between intrinsic motivation and achievement is not reciprocal. During several years they tracked the self-reported intrinsic motivation of school children for math and there achievement and found that achievement did predict intrinsic motivation but intrinsic motivation did not predict achievement. That is a surprising finding. That math achievement predicts intrinsic motivation does not surprise me. I have often noticed that when children start to understand math they tend to start to like it more. But I would certainly also expect that find math interesting would help to get better at it. If you find it interesting you like to engage in math. When you engage in it you are likely to get better at it. But this relation of intrinsic motivation to achievement was not found in this study. 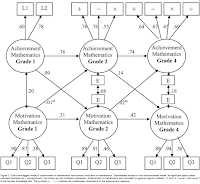 Abstract: This study examined the associations between intrinsic motivation and achievement in mathematics in a sample of 1,478 Canadian school-age children followed from Grades 1 to 4 (ages 7–10). Children self-reported their intrinsic motivation toward mathematics, whereas achievement was measured through direct assessment of mathematics abilities. 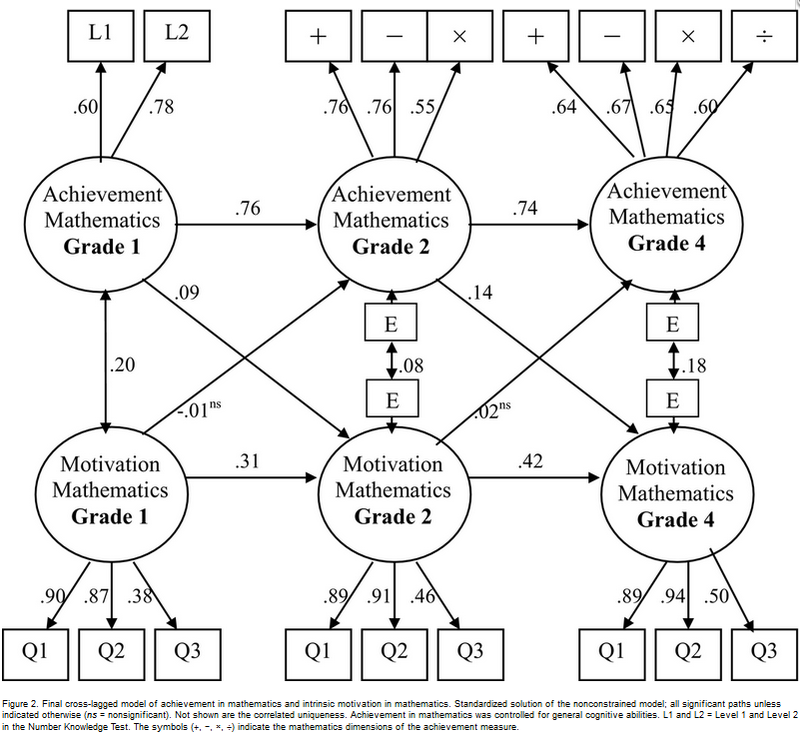 Cross-lagged models showed that achievement predicted intrinsic motivation from Grades 1 to 2, and from Grades 2 to 4. However, intrinsic motivation did not predict achievement at any time. This developmental pattern of association was gender invariant. Contrary to the hypothesis that motivation and achievement are reciprocally associated over time, our results point to a directional association from prior achievement to subsequent intrinsic motivation. Results are discussed in light of their theoretical and practical implications.